The Seigneurie de Beaupré wind farms are developed in the Côte-de-Beaupré region of Quebec, Canada. Image courtesy of Seigneurie de Beaupré Wind Farms. The first phase construction started in June 2011. The wind farm will produce 375MW of energy annually, which will be sufficient for 60,000 Quebec homes. Image courtesy of Seigneurie de Beaupré Wind Farms. The 365MW Seigneurie de Beaupré wind farm is one of the biggest wind farms in Canada. Located in the Côte-de-Beaupré region, the renewable power project was developed by a consortium of Boralex, Gaz Métro and Valener. The project was developed in two phases. The 272MW first phase was officially opened in July 2014, while the 68MW second phase was commissioned in December 2014. 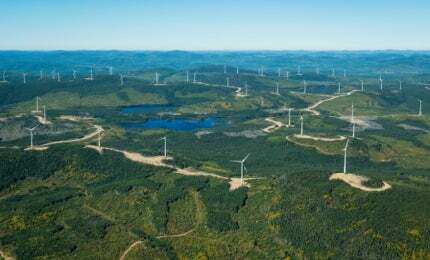 Furthermore, the project included the construction of the 25MW Côte-de-Beaupré wind farm. The wind park is expected to generate clean energy that will be sufficient to power approximately 60,000 households annually. Construction of the first phase commenced in June 2011 and the plant became operational in December 2013. Environmental authorisation for the second phase was received in January 2013 and operations were commenced in December 2014. The two wind farms are located approximately 15km north of St-Tite-des-caps and 60km north-east of Quebec City. The first phase, built with an investment of more than $750m, consists of 126 Enercon E-70 and E-82 turbines rated at 2.3MW and 2MW respectively. The second phase, estimated to cost approximately $200m, includes 28 wind turbines. The E-70 wind turbine has a rotor diameter of 71m and the turbine blades are made with epoxy resin material, with a swept area of 3,959m². The E-82 turbine has a rotor diameter of 71m. Côte-de-Beaupré is a community wind project, which was built by Boralex and Côte-de-Beaupré RCM. It began operations in November 2015. More than 30 local companies participated in the first phase construction. The turbines were erected in approximately 1.5 million man hours. The works also included the construction of approximately 140km of access roads and approximately 60,000t of concrete for the foundations. On average, approximately 400 workers a day took part in the first phase construction. The second phase construction included the installation of 28 wind turbines, turbine foundations and the power collector system, as well as the construction of access roads. The power generated at the wind farm is sold to Hydro-Québec under a 20-year power purchase agreement. The electricity generated is collected by a 180km underground collector system. A substation steps up the 34.5kV electricity generated by the turbines to 315kV for transmission to the TransÉnergie grid. The power is transmitted to the existing Bersimis-Laurentides line via a single 315kV single-circuit line constructed by Hydro-Quebec. A group of banks and financial institutions provided $725m for the construction of phase 1 in November 2011. The key lenders included KfW IPEX-Bank, Bank of Tokyo-Mitsubishi UFJ, Deutsche Bank, Sumitomo Mitsui Banking Corporation, Siemens Financial, and the Caisse de dépôt et placement du Québec, as well as Investissement Québec, DZ Bank and AKA Bank. Long-term financing of the $166m for the construction and operation of the second phase was arranged by KfW IPEX-Bank, Sun Life Financial, and Industrial Alliance Insurance and Financial Services. The financing, closed in October 2013, comprises a $142.4m construction loan, a short-term bridge financing and a letter of credit facility worth $23.6m in total. The $64.6m financing for the Côte-de-Beaupré wind farm was arranged by National Bank of Canada. Enercon was awarded the contract for the manufacture and supply of 126 wind turbines for the wind farm, and to provide long-term service and maintenance for the turbines. Borea was awarded the contract for the construction of roads, collector systems and the substation for the first phase of the wind farm. BBA conducted the detailed engineering, equipment selection and construction assistance for the 34.5/315 kV substation and the collection system for the first phase. SIMCO was responsible to examine the concrete mixture used for the construction of the wind turbine bases in the Wind Park.